From high winds, to torrential downpours and the blazing sun – your roof protects you and your belongings from the elements. Loose or broken tiles, slipped ridge caps, blocked gutters and failed waterproofing – amongst other factors - could potentially cause damage to the structure of your home. Therefore, it’s important that these problems are attended to as quickly as possible to prevent further damage and costly repairs. Inspect your roof on a regular basis. In autumn and early spring, look out for leaves and other debris on the roof and in the gutters. During this time, also check for damage and leaks. It’s a good idea to inspect the roof after any storms with heavy winds. Be on the lookout for loose or broken tiles. Many larger hardware stores stock a selection of roof tiles, but if you have any difficulty sourcing a similar style, try to find out who the original manufacturer was and get in touch with them for assistance. Clean the gutters and downpipes during the late autumn months after the trees have shed their leaves. Check for breaks or gaps in the seams and make certain that the brackets holding the gutters against the house are securely attached. Here’s a simple guide to keeping your gutters clean and functional. Remove overhanging tree limbs. Trees that are growing too close to the house can be a hazard to your roof – there is a risk of branches falling on the roof. On a flat roof with a waterproofing membrane, or IBR sheet roof, leaks can occur when the membrane fails or where fittings rust over time, allowing water to gain access. In houses with pitched roofs, leaves may collect in the valleys between peaks, causing a build-up of debris which will stay damp. The first indications of these are normally damp or wet walls, or stains on the ceiling. For small areas, there are a variety of commercially available products that you can buy to remedy the situation. Larger repairs are best left to the professionals, as the process involves the use of a bitumen product that is heated as it is applied to the roof surface. Ensure that the ladder is safely secured on a flat, level surface. The general rule of thumb is to angle the base of a ladder at a distance of 30 centimetres away from the wall for every one metre of height and the top of a ladder should rest on a secure surface. If you plan to do any repairs to the roof yourself, make sure that you have all the tools, materials and supplies at hand. Make sure that you use the buddy system while working on roofs. You may think it’s a straightforward task, but any job that gets done on the roof needs to be done with the help of someone else. 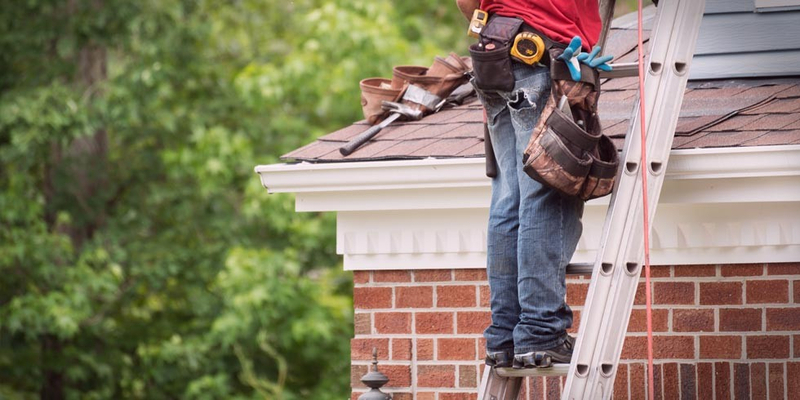 If you don’t have an extra pair of hands to help you, ensure that there is someone on the property who knows you’re working on the roof, and who will regularly check up on you. In order to avoid slipping, don’t work on the roof unless the surface is completely dry. Make sure you get off the roof at the first sign of lightning or rain. Always be aware of the fact that you’re working on a roof, never become distracted, and look out constantly for hazards like exposed nails and broken tiles. Regular maintenance of your roof will ensure that you won’t have to go to the great expense and effort of replacing this important part of your house. Remember to inform your insurer if you make any changes to your building, which may affect your building insurance cover. For example, if you decide to replace your tiled roof with a thatch roof without telling your insurer, you will be paying the incorrect premium, as the risk of fire damage is much higher for thatch, and your home will not, in this case, be covered for fire damage.